Barley and Lentil soup is hardy and nutritious; make it in a crock pot. 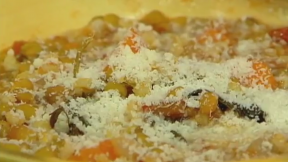 Watch Mary Ann Esposito make Barley and Lentil Soup at CiaoItalia.com! Rinse and sort the lentils. Add lentils and barley to a crock pot. Tie the herbs together with cooking string and add to pot along with all the rest of the ingredients except the cheese. Cover and cook on low heat for 12 to 14 hours, or on high heat for 5 to 6 hours. Discard bay leaf and tied bunch of herbs. Serve hot and pass cheese on side.